On another very hot day, Melton Mowbray Golf Club welcomed 160 competitors for the fourth annual Cropwell Bishop Stilton Open on Sunday. Playing a fourball am-am stableford, the golfers found the fairways encouraging plenty of run on the ball, forcing them to carefully choose the correct club to stop the ball on the greens. Scoring was very close, with only 10 points separating the top 10, as the combined Six Hills/Kirby Muxloe team of Gary Baxter, Michael Barnett, Glyn Dennocks and David Stevenson won with an excellent score of 100 points. They won by just point from Melton GC club captain Glenn Price with his team-mates Gerry Stephens (vice-captain), Eddie Cham, and Bob Luke. Price did pick up a nearest-the-pin prize after almost carding a hole-in-one at the par three 14th hole. Results: 1 Gary Baxter, Michael Barnett, Glyn Dennocks, David Stevenson 100pts; 2 Glenn Price, Gerry Stephens, Eddie Cham, Bob Luke (Melton) 99pts; 3 Geoff Townsend, Danny Raven,David Taylor and Kris Owen (Melton) 98pts; 4 Tim Mortimer, Sam Pollard, Mick Pollard, George Boddy (Melton) 95pts; 5 Chris Budd, Chris Frake, Duncan Spalding, Andy Vernon (Edwalton, Willesly and Woollaton) 94pts. Nearest the Pin: Gordan Bruce (5th), Glenn Price (14th). Longest drive (11th): Rob Hedworth (Rushcliffe). The winners concluded the prizegiving with a speech to congratulate everyone on the overall success of the day, and particularly the excellent preparation of the course under the hot and dry conditions. * Drina Terzza was a comprehensive winner in the Past Lady Captains’ Trophy. A field of 14 former lady captains from Melton GC along with new members who have captained elsewhere competed for the prestigious trophy. There was also an in-house putting competition for the ladies unable to play 18 holes which was won by Margaret Pedge, while Liz Snow won the prize for sending her drive closest to the line. But the overall champion, as well as nearest-the-pin winner, was Drina who received her prize from the current lady captain Sandie Normanton. * In their latest match at home last Tuesday, Melton Seniors fought hard at home to an experienced Ruddington Grange team. Melton narrowly lost the reverse fixture to Ruddington and were keen to make amends. 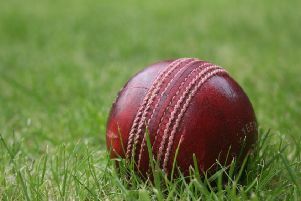 In a close and nail-biting affair, both teams had to wait for the last pairing to come in to settle the match which ended in a hard-earned four-all draw. Melton point scorers: David Wells/Jim Mcquillan won 5 and 4, John Webb/John Squires won 1-up, Don Benzie/Dennis Dayman won 2 and 1, Haydn Snow/Jim Shaw won 3 and 2.